Remember love; love is what it takes to dream. Rudhyar suggests this symbol is representative of the indestructible nature of the socio-cultural contributions of man that contain at their base some form of archetypal meaning. In the imperfect leftovers of this contribution, the whole form is lost (as the tree trunks lay broken), but the essence of their meaning is successfully communicated, and so they maintain their potency. Petrified wood has become akin to stone through its transformation process. In crystal therapy, petrified wood is used for its healing properties to assist one in moving forward through grounding more fully into their vision of personal destiny. Because the gem contains both elements of Wood and Metal, we can apply a TCM approach in saying that the energy is at once stimulating and refining, transformative and initiating. The desert landscape on which these pieces symbolically fall evokes another layer of the tenacity, ingenuity and adaptability it takes to achieve this forward motion of transformation in natural surroundings that don’t offer easily accessible nourishment, especially in the form of water. Curious as Pisces is a Water sign, although it’s watery terrain is admittedly often more akin to the subtle fluidity of ether, rather than the nourishing water of Cancer or the oceanic subconscious depths of Scorpio. Rudhyar takes this to be the divine protection offered to us by invisible supportive forces of spirit, most noticeable in times of crisis but also having a place in the general maintenance of life processes on this planet. These are the devas of the plant kingdom and the spirit entities that work the soils of the Earth and bring protection to human beings. As a general picture, I feel this Moon sheds light on the transformative work that has been done over this intense summer of eclipses, retrogrades and the like, us humans left seemingly alone in the desert-like climate of these pressurized cosmic forces to do the great work of petrifying ourselves, leaving behind the unnecessary elements of relationships, thought processes and emotional reactions in order to arrive at the essence of the thing, of the work, allowing us to initiate a new spark and promptly kill off much of the karmic weight that was stewing in our unconscious unchecked. And yet, throughout this seemingly lonesome and arduous task, we were supported. There was a sense of reward with each unveiling; every breakdown took us into a foreign but familiar land that promised relief on the other side, and for those of us willing to actively converse with the unleashed forces at work, great potential lay ahead. This Moon is happily sandwiched between two cosmic events that herald progress to come and are positive omens for the Fall season ahead. On Saturday the 25th, a grand Earth trine between the Sun, Saturn and Uranus brings in a greater sense of stability and flow in the areas of our life related to work, finances and building our foundations. On Monday the 26th, Mars turns direct in the wake of the Full Moon, and does so at its point of exaltation at 28 degrees Capricorn. This promises much more visible and recognized progress along our individual paths of success, which will feel like an immensely liberating and relieving shift after a long summer of feeling like we were either standing still or moving in circles (remember Mars has been retrograde since June 26th!). This Full Moon reminds you of the balance between mundane efforts of productivity and your spiritual growth. If you find yourself in a period of work, bring ritual into your day to day that reminds you of the expansive nature of reality. Take time away to reflect if needed, and pay special attention to caring for your body at this time. This Full Moon brings in hues of eclipse season for you, as it falls in the natural houses of Aquarius and Leo, the primary energies involved in July's string of eclipses. Ground fully into your creative energies and be mindful of your contribution to the community and collective. Allow your vision to inspire others and be inspired by those with the courage to share their talents freely. This Moon asks you to bring balance to your personal and professional life. Are you compromising your deepest emotional needs for advancement in career, or staying in a place of comfort and security that compromises your ability to take a risk in moving forward? Reflect on the intimate connection between your deepest inner world and your relationship to your work. This Full Moon brings attention to what you have learned over the last few months and how it has contributed to your world view. Are you able to ground your spiritual philosophy and apply it to your day-to-day decision making process? Reflect on your ability to elevate what appears mundane in order to understand its greater place in the schema of all things and how they weave in and out of your life experience. This Full Moon asks you to root more deeply into your personal power, Leo. Regardless of your financial circumstances, you have to relate your power to the power of your potential, and your self-worth to the innate knowing of your individual skills and abilities. Revisit what is uniquely you and release the conditioned beliefs that block you from receiving abundance from the outside world. This Moon highlights the relational axis of your life, Virgo, asking that you mind the balance between self and other most carefully at this time. What is your authentic way of being and what relationships in your life are able to reflect your true self back to you? It is in your nature to give and to be of service to others, but establishing appropriate boundaries will be very fruitful at this time. This Moon brings focus to your health and spiritual well-being, Libra. If you haven't taken time to reflect and retreat somewhat from the outside world, this is a fruitful time to do so. Especially if your body communicates through illness or exhaustion, it is important you take some time to reconnect with yourself and the divine seed within you. This Moon brings attention to your creative efforts and the contributions you are making to the human family through the expression of your raw talents and gifts. There is an echo of the eclipse energies in this Full Moon for you, and it is important that you continue the work of grounding into your life purpose more fully during this time in order to reap all the benefits. This Full Moon asks you to bring balance to your career ambitions in order to tend to your inner emotional landscape. If you haven't been making the strides you are longing for in the outer world, a signal calls for your attention to see if you are properly nurturing yourself and loving yourself in order to create a more secure emotional landscape that those around you can rely on. This Moon brings your awareness to communicating and expression what you have learned through conversation, writing, or another outlet that allows you to solidify your higher knowledge. Connect with others to share ideas during this time and recognize more fully the subtle blend of mundane and psychedelic that exists in the day-to-day. 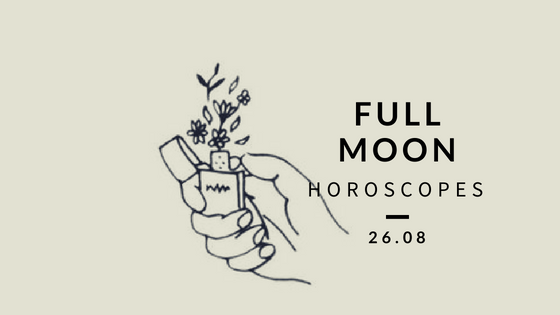 This Full Moon asks you to ground more fully into financial matters and nourish a positive sense of self-worth and personal power that is not determined by outside influences. Your true potential is limitless, but in order to follow the expansive path, you have to fully take ownership of this knowledge within you. See what decisions you are making out of financial fear, and which ones could be made if you had financial faith. This Moon brings attention to your relationships, Pisces. As you are changeable, mutable, and naturally inclined to serve others, it is important for you to take stock of your relationships at this time and to see how fully they nourish your sense of personal uniqueness and individuality. If there are relationships in your life that require much compromise and do not reflect your most authentic self, it would be wise to reconsider their value.